Rites of Passage are ancient traditions which mark the transition from child to adult. In the ancestral homeland of Africa, men drew boys out of the village to take them through the procedures of initiation into manhood. The women took the girls apart to teach them the roles women should play. When the period of isolation and teaching was completed, the young people were brought back into the village to celebrate this new stage of their lives. 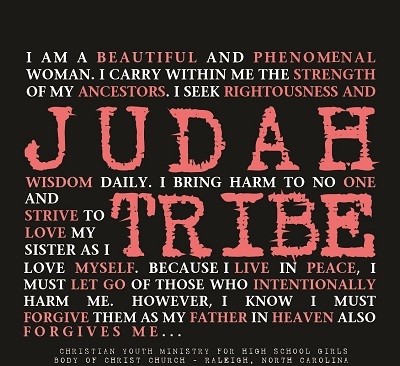 The Judah Tribe Rites of Passage Program at Body of Christ Church seeks to reestablish this lost tradition by having women train high school females in various areas of womanhood which will develop them into becoming virtuous women. The program is also rooted in two biblical references: Titus 2:4-5and Genesis 49:8. Contact judahtribeleaders@bodyofchristchurch.org for additional information.